The Donetsk People's Republic Operational Command said Friday that exits and entrances to Donetsk have been closed following a blast that left the republic's head Alexander Zakharchenko dead and three more injured. 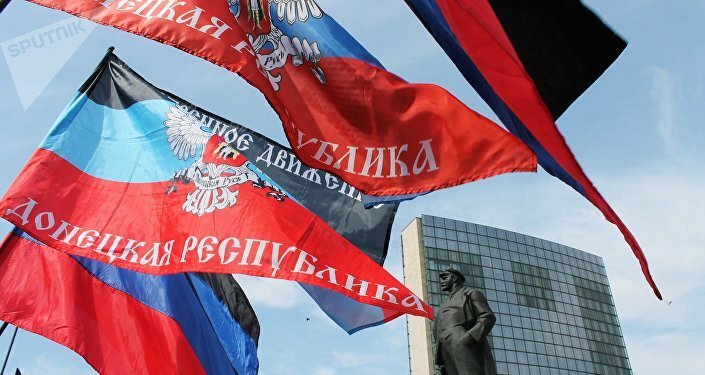 A lawmaker of the People's Council of the DPR confirmed reports about the death of DPR leader Alexander Zakharchenko in a bomb explosion in downtown Donetsk on Friday. "The DPR leader died in the explosion at Separ cafe," Vladislav Berdichevsky told reporters. Later reports revealed that 11 people had been killed or wounded in the blast. Later, the adviser to the DPR head said that the bomb that killed Zakharchenko was deliberately placed in the restaurant he was visiting. According to the government source, Zakharchenko died due to a severe head wound. The security source with the self-proclaimed People's Republic told Sputnik that DPR Finance Minister Alexander Timofeev was also wounded in the incident. Addressing the death of the DPR head, Russian Foreign Ministry spokeswoman Maria Zakharova said that Moscow considers the blast to be a terrorist attack carried out by Kiev. "Instead of implementing the Minsk agreements and looking for means to settle the internal conflict, Kiev's party of war is implementing a terrorist scenario and is aggravating the already difficult situation in the region. Without fulfilling its peace promises, they decided to launch a bloody slaughter," Zakharova told reporters, also calling for an impartial investigation, monitored by the international community. According to the diplomat, since the West had assumed control over the situation in Ukraine, it was now the duty of the Western governments to "guarantee an impartial investigation" of the incident. These words were followed by another statement of the Russian Foreign Ministry, which stressed that the assassination threatened to seriously destabilize situation in Eastern Ukraine. "We call on the Ukrainian authorities to abandon their reliance on terrorist means in resolving Ukrainian internal problems. We hope that the responsible Ukrainian politicians will find the strength to stop the the 'party of war' and prevent the escalation of conflict in Donbas," the statement said. The Security Service of Ukraine (SBU), in turn, rejected the accusations of involvement in the assassination. "We confirm this information [about Zakharchenko's death], but Ukrainian security services have nothing to do with this. In our opinion, this was the result of wars between local leaders dividing something," SBU spokeswoman Elena Gitlyanskaya told the UNN agency. Zakharchenko joined the Donetsk militia following a coup in Kiev in 2014 and was elected leader of the Donetsk People's Republic in November 2014.